Here’s the hat I made for Mary, the one I mentioned I was starting the last time I posted a finished knitting project. 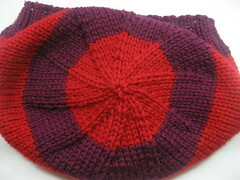 More precisely, here’s the top of the hat, which is my favorite part; the swirl of decreases pleases me. It’s a simple knitted beanie very similar to one I made for the charity auction last March that both of us (or all three of us: Mary, the hat I donated to the auction, and I) attended. I used one of my go to hat patterns from Quanah’s website, doing my typical modification of adding length. I think it’s better to have a hat come too far down over one’s ears than not cover them completely. Given the weather Mary’s area is getting right now I’m thinking I should have made a warmer pattern, but it won’t always be that cold there. For the yarn, I used some Knit Picks Swish worsted weight that I had in my stash; I’m not even sure if both of these are still current colors. I’ve got another hat on my needles now (and am still neglecting the socks in progress which spent the summer in Washington state without me). Someday I’ll find the motivation to make another sweater; for now I’m happy doing smaller things. On this date in 2009: : Single Sock Syndrome, which is not, as one might expect, about knitting. 2008: Long Before I Was Born, in which I shared one of my mom’s childhood drawings. 2007: WDW 7: The Final Chapter, in which I finally wrapped up my epic trip report. 2005: Winter Count—June, in which I remembered a visit from Mel. I miss our QuiltCons, but neither of us is doing nearly as much quilting as we used to. 2004: Sunrise, in which I took a break from writing morning pages. It’s been ages since I wrote morning pages. 2003: Yes, I Will Have Some Cheese, in which I was whining about a very much first world problem. 2002: State of the Toenails Address, which is just what it sounds like. It’s a beautiful hat and plenty warm, even in the current snowy weather. Thank you so much!